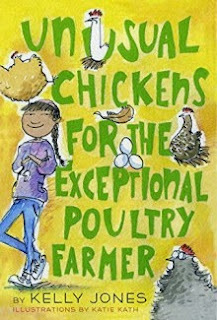 Recommended to: Young readers who love vibrant young heroines, or any readers interested in chickens! I have to say, this book is rather adorable. Although a lot of the middle grade novels I read are steeped in magic, Unusual Chickens for the Exceptional Poultry Farmer would probably fall under magical realism. Sophie's family feels real. They've fallen on hard times, and are trying to adapt to living in a new place. All Sophie wants is something to cling to. Something to call her own. Enter the magic, interestingly enough, in the form of chickens. Sophie gets my love as a narrator. This story is told in a series of letters, which are almost like her diary entries. See, Sophie tends to write to her grandmother and her uncle. Both of whom have passed away. It's as though writing to them helps her feel connected, and figure things out. I loved this part. Seeing her thoughts on paper and feeling her emotions made this a great read. After all, we're most honest when we don't think anyone else will see what we write. The magical aspect of this is what didn't really catch my attention. While it was cute, it felt a little too juvenile for my taste. That's not to say young readers won't love it. In fact, I'm certain they will. It's definitely a breath of fresh air to see a young girl interested in farming and the outdoors. One who understands hard work, and isn't afraid to try. Although it didn't vibe with me, I see Sophie being a great role model for younger readers! She's a sweetheart. So, three stars it is! If you have a young reader with an interest in chickens, this would be a great book to give them. There are little pieces of information about each chicken featured, some fun worksheets on how to care for them, and even a recipe (don't worry, not for chicken) thrown in. Overall, it's a cute package. Enjoy!